Paul attracts a crowd and gets his client’s message heard. How busy is your tradeshow booth? Paul's number one priority in working tradeshows is not simply to entertain with magic, or even to attract attention to his clients' booths. His goal is to help generate sales. There's no denying the crowds that Paul draws, but if you watch him work you'll witness a true salesman. After graduating from Yale University, Paul was employed by Leasing Dynamics Incorporated (LDI), a major computer firm. Here, he mastered the game of sales and learned that, all else being equal or close to equal, people buy from those they like. It's no secret that Paul even relied on his magic to close sales back in his LDI days. As Paul himself had said, "When people like you, they trust you and they'll buy from you. With magic, people have the feeling you have the inside scoop on the truth. If you begin telling them about a product or service and it's advantages, they listen." There's no hard pitch involved in tradeshow magic, but having been a salesman himself, Paul effortlessly and naturally weaves the product's benefits into his performance. He piques interest, then directs folks to your sales team so they can set up appointments or even make sales right there at the booth! Paul even adds impact to your tradeshow giveaways. When a stress ball with your company logo miraculously appears in a woman's purse, you can guarantee she's going to show that stress ball...and tell your story...to everyone she knows! Be it a logo'd deck of cards, a mug, a pen, a t-shirt or anything else, Paul can give it that magical touch that gets you remembered far longer and with more impact than your competitors. 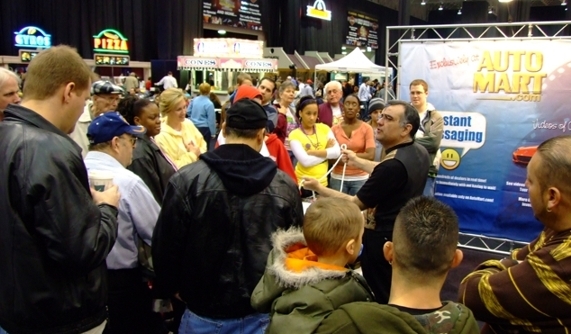 Paul has been working tradeshows throughout the U.S. for over twenty years. He's worked his tradeshow magic at venues both large and small, but always with the same outstanding results for his clients. Some of the companies Paul has worked for recently include Hinckley Lighting and the website and magazine Automart.com.